Is TaiG v2.4.3 Jailbreak Compatible With iPod touch 6? Behind the 5th generation iPod touch Apple has released the 6 generation iPod touch introducing new features. iOS 8.4 the latest firmware is running and A8 CPU powered to the new iPod. The new iPod touch is the most attractive product and it is actually surprising. We know that most people already having apple smartphone in their pockets and I think that smartphones have in today’s market. But with the new iPod touch launching most people’s advertency going towards the new iPod, because now iPod touch 6 jailbreak ability has been confirmed by TaiG jailbreak. Nowadays TaiG jailbreak is exceeding all other jailbreak communities. Finally they could jailbroken iOS 8.1.3 – iOS 8.4 all iPhone, iPad and iPod touch with their new TaiG v2.4.3. In nearly day download TaiG 2.3.4 has out on the beta stage and it confirmed officially. As we mentioned Apple confirmed that the new iOS 8.4 powered to the new iPod touch. So if you think that is TaiG v2.4.3 jailbreak compatible to iPod touch 6 jailbreak? Yes. The answer is yes. TaiG told with taiG jailbreak release note that TaiG v2.4.3 jailbreak releases for all iPhone, iPad and iPod touch running on iOS 8.1.3, iOS 8.2, iOS 8.3 and iOS 8.4. So you can jailbreak your iPod touch 6 using TaiG v2.4.3 jailbreak. Some sources indicated that iPhone 6’s features almost same as iPod touch 6 features. The new iPod touch maintains as identical exterior design and especially removing the iPod touch loop button. Silver, gold, space gray, pink, blue and product red interfaces are available. 1 GB RAM, 8 megapixel camera as the main features included in the new iPod. However, now we enter to the iPod touch jailbreak. We know all cydia lovers expect to jailbreak their iDevices and download number of latest cydia tweaks and apps. If you already having the new iPod touch 6, then you can install cydia on it using TaiG v2.4.3 jailbreak tool. Keeping device backup via iTunes or iCloud, you can begin the process. Find my iPhone, Passcode or Touch ID need to be disable mode before you go ahead of the jailbreak. TaiG jailbreak tool download links available on the TaiG’s main page. Download it and connect your iDevice to your computer. Then run the tool as an administrator. Wait until complete the device identification. Don’t remove the tick of the Cydia 1.1.23. Unmark another check box of 3k assitant. Then click on the start button. iPod touch will reboot at once and taig will inform that “Jailbreak Successful”. Process is complete. Find out the cydia icon on your iPod touch screen and join with your favorites. TaiG team has released Taig v2.3.4 official interface in nearly day. As you know it was on the beta stage before release it as an officially. 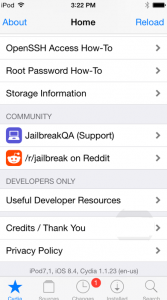 TaiG v2.4.3 jailbreak tool released to jailbreak iPhone, iPad, iPod touch running on iOS 8.1.3 – iOS 8.4. Don’t forget that TaiG jailbreak is currently recommended only for windows. Mac users can jailbreak using PP jailbreak tool. Go to the TaiG’s official web page to take TaiG download tools correctly. 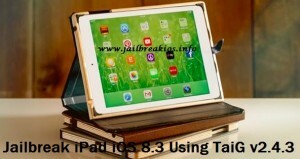 Now we guide you to how to jailbreak iOS 8.3 iPad using TaiG v2.4.3. To jailbreak your iPad follow our proper guidelines below. Step 1 – Using iTunes or iCloud take full device backup all of your important data of Pad. Something goes wrong while the process, you can use backup to restore your iPad. Step 2 – Navigate to the iPad’s settings app and find out both “Passcode or Touch ID” and “Find my iPhone” features. Step 3 – Enable Airplane mode on your iPad. Step 4 – Disable all anti virus programs which you installed for your iPad secure. Note – After the process you can enable anti virus programs, Passcode lock and Find my iPhone. Don’t forget to disable airplane mode at the end of the process. Step 5 – Download TaiG jailbreak new tool. Step 6 – Attach your iPad to windows based computer using USB data transfer cable. Step 7 – Find out the downloaded file and run it as an administrator. Wait until identify your iPad by TaiG. Step 8 – Uncheck 3k assitant option below the cydia 1.1.23 checkbox and then click on the “START” key. Step 9 – Stay until complete the jailbreak process. Step 10 – At the end of the process your device will reboot automatically and cydia icon shows on your iPad’s home screen. Warning – Don’t use your iPad while the process going on. If you disturb to the process, then process will stop before the end. Unfortunately if you failed on the TaiG jailbreak, then you can try again. Hi Gays, in nearly day Apple has out the 6 generation iPod touch. Apple’s new firmware version of 8.4 is running on the new iPod touch. The team of TaiG has stopped beta releasing and in nearly day they released TaiG v2.4.3 jailbreak tool officially. It means that the new version is out of the beta. TaiG download v2.4.3 tool is compatible all iPhone, iPad and iPod touch running on iOS 8.4 – iOS 8.1.3. As we mentioned the new iPod touch 6 also running on iOS 8.4. Because of that we can say that the TaiG v2.4.3 jailbreak tool is compatible for the new iPod touch. However, all cydia lovers are expecting to download new cydia tweaks for their device modification. So if you are already jailbroken your iPod touch 6, then TaiG jailbreak has introduced number of latest cydia tweaks for you. Follow us to choose your favorite tweaks. BetterFourByFourFolders – The tweak allows you to include 46 apps in a single folder. AquaBoard – You can add water effects to home screen of the iPhone or if you like to add those effects to lock screen, it also easy to do with this tweak. GroovyLock – You can add widgets to the lock screen using the GroovyLock. ColorFlow – Your music app will automatically colorize with the currently playing song’s album art. Transition – You can add the cool animation for the device unlocking time. Alkaline – The tweak allows to you to theme battery, data indicator and Wi-Fi. Actually Alkaline is the beta theming tool. SaveGram – You can save instagram photos to the camera roll using SaveGram. OneTapClear – You can clear your notification field within single tap. CallBar – You can stop calls from interrupt you. LockGlyph – When you lock your phone using touch ID you and add Apple pay’s animation or sound to the iPhone’s lock screen. CC Desperator – you can remove control center’s line separators using CC Desperator. Emoji83+ – You can enable hidden emojies and spock emoji on your iPhone. TaiG team has opened their official page to download TaiG jailbreak tools. So you can download taig v2.4.3 new tool from the TaiG page and click below link to jailbreak your iPhone, iPad or iPod touch using TaiG v2.4.3. TaiG v2.4.3 integrate Cydia 1.1.23. First of all you must take backup of your important data using iTunes or iCloud. When you something goes wrong, then you can restore your idevice with device backup. Find my iPhone and Passcode or Touch ID options need to be sleep before go to the head with jailbreak. Options changes can make from the settings app. Go to General menu in the settings app and turn off Passcode lock and then go to the iCloud and disable Find my iPhone. If you installed anti virus programs to secure your device from any threads, then you must turn off them before you begin the process. Take a computer with windows OS, charge your idevice battery and go to the first step. Step 1 – Download TaiG v2.4.3 correct file to jailbreak iOS 8.4. Step 2 – Connect your iOS device to computer using USB data cable and unzip the taig zip file before it run. Step 3 – Right click on the TaiG tool and give a click on the “Run as Administrator”. Step 4 – TaiG will recognize your iOS device within few minutes and shows the TaiG jailbreak window on the computer’s screen. Step 5 – You must unmark 3k assitant checkbox and press on the “START” button. Step 6 – TaiG will jailbreak your device itself. Step 7 – Device will reboot at once behind the jailbreak and cydia icon will appear on your iDevice home screen informing “Jailbreak Failed” message. Warning – Don’t try to use your device while the process going on. If you try to make any call, message or other, sometimes it will be the main reason which jailbreak failure. Apple’s latest iPod touch 6 has just released to apple users. The new 6th generation iPod touch is the successor to the iPod touch 5G. 5th generation iPod touch was released in 2012 and the new generation released three years back. However, if you got an iPod touch 5 then you can jailbreak to install cydia, because the latest iPod touch runs on firmware version 8.4. As you know, in nearly day TaiG and PP released their jailbreak tools to jailbreak iOS 8.4 – iOS 8.1.3 firmware. 6th generation iPod touch’s features almost same as iPhone 6. A8 CPU, iGB RAM, 8 megapixel camera and iPod touch 6 powered by Apple’s A8 chip. And especially it is running on iOS 8.4 Apple’ current mobile operating system. Therefore it is no surprise that Taig jailbreak and PP jailbreak work on it. 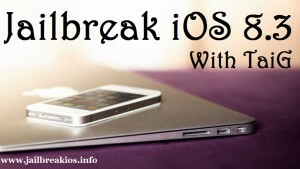 To jailbreak your iPod touch 5 follow our tutorial. You can gain taig download or PP jailbreak as your choice for your desktop or mac OS. The new iPod touch ships with iOS 8.4 out of the box, it is still recommended a fresh iOS 8.4 restore before start the jailbreak. Use iTunes to do device restore. Note – Don’t forget to take device backup you may have on the iOS device earlier restore or jailbreak. Use iTunes or iCloud to do device backup. see the screenshot of jailbroken iPod touch running on iOS 8.4. it’s running the latest cydia 1.1.23. Make sure if you disabled “Find my iPhone”, “Passcode or Touch ID” and all anti-virus softwares. Enable Airplane mode before jailbreaking. Especially you must charge your idevice battery. Full battery will help to continue the process properly without battery drain. Step 1 – Download TaiG jailbreak tool on your PC. Step 2 – Connect your iPod touch 6 to your computer using USB data transfer cable. Step 3 – TaiG tool downloaded as .zip file. You must unzip it and extract it on your PC’s desktop using as an administrator. Step 4 – Your device will identify by TaiG within few minutes. Step 5 – You can see the option “3k Assitant” on the jailbreak window. Uncheck it and click “Start” to run the jailbreak process. Step 6 – Your device will reboot itself after complete the process running. Then you can see the cydia icon on your idevice home screen. If you don’t have a windows OS PC , then you can run PP jailbreak tool using virtual PC. Either jailbreak tools works fine with iPod touch 6. 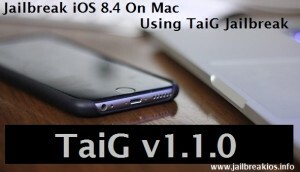 TaiG has been released TaiG v2.4.3 beta version to jailbreak iOS 8.4 – iOS 8.1.3. This is the English version and recommended only for windows platform. Mac users can use PP jailbreak, it has released in nearly day. TaiG v2.4.3 optimized the process of jailbreak. Now all of guys can download taig tool and install cydia on iOS 8.4. All iPhone, iPad and iPod touch running on iOS 8.1.3, iOS 8.2, iOS 8.3 and iOS 8.4 support with TaiG v2.4.3 jailbreak. As you know TaiG v2.4.1 beta had fixed the getting stuck at 60% issue. TaiG v2.4.2 as the behind version of TaiG v2.4.1 had been released with fixing stuck at 30% and 40% issue and it integrated Cydia 1.1.23. The new taig jailbreak version came out just couple of days after the TaiG v2.4.2 release. TaiG v2.4.3 beta is the only taig 8.4 jailbreak version which is optimized the jailbreak process. TaiG v2.4.3 is not relevant for already jailbroken iPhone, iPad and iPod touch. The version is currently available on the beta stage. Therefore some jailbreakers are warning about those betas. If not necessary you can ignore TaiG v2.4.3 beta and use previous taig versions. Optimize the process of jailbreak with TaiG v2.4.3. Disable Passcode or Touch ID and Find my iPhone options from setting app. Passcode lock’s settings from General menu and Find my iPhone’s changes on iCloud menu. All anti virus programs or firmware need to be sleep before the process. Using iTunes or iCloud do full device backup before begin the process. Unfortunately something goes wrong and if data loss, backup will the better plan to restore your iOS device. Step 1 – Download TaiG v2.4.3 on your computer. Step 2 – Attach your iOS device to computer using USB cable. Step 3 – Unzip the taig zip file and run it on as an administrator states. Step 4 – TaiG will recognize your iDevice within few times. Then you have to click 3k Assitant option below the cydia 1.1.23 and then click on the START button. Step 5 – Device will reboot after few times and taig will inform that “Jailbreak Succeeded”. Cydia icon can see on the iDevice home screen. Wait with us for more….. The advanced Chinese jailbreak hacking team of TaiG has pleasantly surprised all their fellows by announcing TaiG jailbreak tool to iOS 8.1.3 – iOS 8.4 jailbreak. Although we seem that TaiG is updating day by day and they trying to reach another iOS 8.4 jailbreak major version without any error. 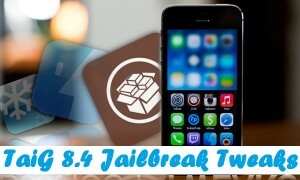 Therefore nowadays they are releasing TaiG 8.4 jailbreak beta versions while iOS 9 experiments. As you know Apple is going to release iOS 9 download so soon. Three beta versions of iOS 9 already published. However all cydia lovers’ are hoping to take new experience with cydia tweaks. We glad to say guys now you can take latest number of cydia tweaks via TaiG 8.4 jailbreak. Top cydia tweaks are spreading via internet and now we hope to bring TaiG 8.4 jailbreak tweaks information to you. TaiG v2.4.2 beta is the latest TaiG jailbreak update integrates cydia 1.1.23. You can download TaiG jailbreak tool from TaiG’s page. iFiles – iFile like a file manage and it gives access to your iPad or iPhone’s file system. It opens the entrance to view various types of files like zip, pdf and etc. Cylinder- Number of animations give to page animations such as 3D-cube effects. PrismBoard – The tweak make Keyboard translucent with random key popup color. IfFound2 – The tweaks help to return your loss device. ReachApp – It brings split-screen multitasking for iOS 8. Phantom for Snapchat – The tweak will unlock Snapchat’s limitation. MTerminal – Terminals for your all iOS devices. You can use terminals to make any changes for the default root password. TapToSnap – You can take a picture easily within one tapping on the camera viewfinder. CCBackground – You can set background wallpaper to control center with CCBackgroud. Barrel – This is the other useful tweak that brings various cool page animations. Cask – You can add cool fading effect when you scrolling through the table views. HapticMusic – You can make vibration of your iPhone when the song changes. Repower – The tweak will inform useful messages in the “Power Down” view. ColorBadge – You can change notification colors on your iDevices’ home screen. Sleekkey – You can remove all lines from keyboard. SmoothPop – Choose fade out or fade animations to your character previews. Clearlocknotifications – You can clear all notifications from the lock screen.